Do You Ever Want Real Raises and Benefit Again? Then Fight the Race to the Bottom! By Richard Mauro, for Galvanize America, 6/13/18. "We sure would love to help you but you know the budgetary situation just won’t allow it." "I certainly do value the job teachers do, and rate education as a top priority but times simply have been to too tough." "You know, the economic policies we’re pursuing now are so effective that just hang in there, in a year or two we’ll no doubt be able to authorize impressive raises and get those healthcare premiums reigned back in." Comments such as these flow year after year from state politicians especially across the heartland in the many states controlled by Republican lawmakers. In the meantime, state employees continually endure meager or non-existent raises which when taking inflation into account mean pay cuts, and steadily degraded health insurance, retirement plans and other benefits. The kicker in all this is that it is unnecessary. This austerity for government employees (and most other working Americans also) is not a consequence of difficult times in our economy, especially not in the last eight years since we turned the corner from the great recession. It is a consequence of economic policies purposely contrived to suppress wages and worker’s rights, and to direct absolutely as much money as possible into the hands of the wealthy. It is engineered by “trickle down”, “bought and paid for” politicians, mainly Republicans, who pander to the interest of the big money contributors to their campaigns and hurt terribly our working people and country in doing so. I and many others call it the “race to the bottom” and I would like to explain as succinctly as possible how it works. The Race to the Bottom is not is not a consequence of difficult times in our economy. It is caused by economic policies purposely contrived to suppress both wages and workers rights, and to direct as much money as possible into the hands of the wealthy. First off, Republican lawmakers, at both the state and federal levels, desperately strive to hold down employee wages. They virtually never propose a raise in the minimum wage and fight like cats and dogs to defeat this proposal when it is made by other lawmakers. It is a myth that raising the minimum wage benefits only lower income earners, though it certainly does do that very effectively. The height of the first floor determines the height of all the floors above it. Raising the minimum wage which was once done regularly and very prudently in this country to benefit workers, in time elevates the paychecks of virtually all employees up to the the mid-management level. Simultaneously, they work determinedly to weaken and kill unions. They pass “right to work” laws (which really should be renamed “right to work for less” statutes), eliminate prevailing wage requirements, and take various other actions designed to substantially weaken the bargaining power of unions and make it very difficult for new unions to be established. In the 1950’s/60’s the economy of the United States was for the most part booming and actually provided “shared prosperity”, i.e. when GDP grew and Wall Street benefited American workers truly benefitted also. Union membership at this time was very robust and included about one-third of American workers. This strong union presence in the economy along with a government that had mottos such as “what’s good for the middle class is good for America”, and actually backed it up in policies, is what created and grew the middle class by requiring that companies give a fair proportion of their income and growth to their employees in wages and benefits. Contrast that to today when union membership in our country has declined to about 11%, and many unions that still exist have been weakened by Republican policies, and it becomes more understandable (though still very sad) that American worker’s when adjusted for inflation have not had a significant raise for about 40 years. This, despite the fact that profits for many companies, especially in recent years, have been outstanding. And, in that same time period after similarly adjusting for inflation, the average pay of CEOs has risen nearly 1000%1. The net effect of these stagnant wages, besides simply tough times for the vast majority of us, is flat tax revenue for governments. Likewise, because incomes for most are poor or quite marginal, reliance on public assistance programs is great which further strains government budgets. Now you would think that since our economy is growing well, even though little of that increase is making its way to workers, that tax revenue would still not suffer because the wealthy and corporations would take up the slack. Oh, but that is right. The only thing Republican led governments love to do more than suppress fair wages for working people, is to grant never ending tax loopholes and cut tax rates for the well-to-do and their corporate benefactors. Thus, we get to the crux of the problem. Because of these anti-fair wage, anti-fair tax for the wealthy policies, governments are in a perpetual state of tight budgets and spending cuts. Teachers, other public employees, and in reality, nearly all working Americans, have to continually tighten their belts, make economic sacrifices, and look to a future that never seems to get better. Corporations and the rich, meanwhile, profit handsomely, enjoy the fruits of a rigged system, and capture a ridiculously large and ever-growing part of the American economy. It is quite simply “the race to the bottom” for most of us and it quite decidedly is not going to change until the underlying policies that have created and sustain it change. and provide the jet fuel for growth in our economy by giving it what it needs most but currently lacks: money in the pockets of people who will spend it. Contrast this to the longer-term impacts of the recent Republican tax cut which are a surging budget deficit, higher taxes for most working and middle-class Americans after nine years2, and that much more money into the pockets of the 1% at the expense of most everyone else. The Solution, step 2 - Take action! A second approach in terms of turning this economic conundrum around for working people is simply political activism and strikes. Labor unions and determined, effective strikes were an important key in building the middle class in this country in the first place. Their reduced presence and activity in recent decades is an important factor in the economic degradation of our middle class. Support laws and the appointment of judges that empower unions, and worker’s rights, safety, and benefits. Wildcat strikes and demonstrations are called for too. Forty years without a raise and with consistently eroding benefits is too long! What’s the American employee going to do, wait 80 years before action is taken? 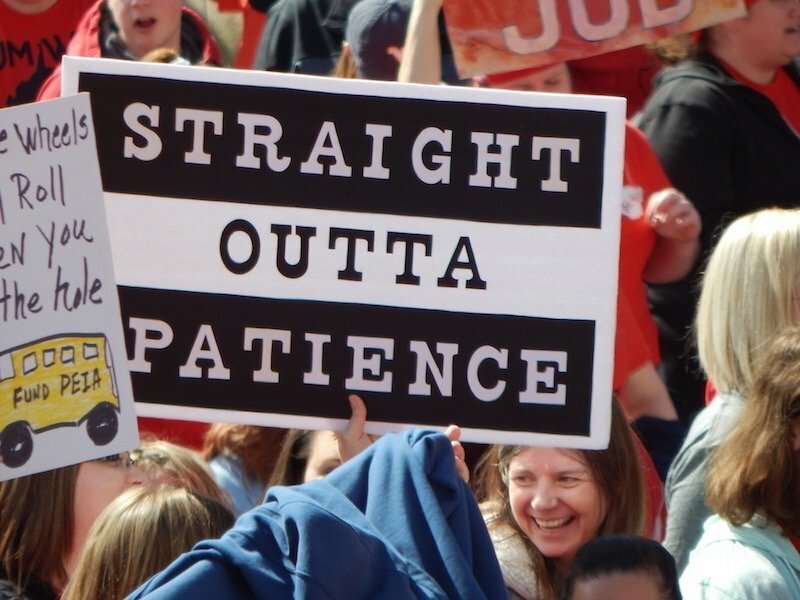 The recently concluded West Virginia teachers strike is a prime example of what can be accomplished. Despite no clear legal right to strike, and three unions being involved but many teachers actually not even belonging to any union, the teachers mounted an impassioned, unified statewide strike that met with great success in terms of pay, benefits, policies, and principle. Actions such as this are called for on many levels across the nation to increase employee wages, retirement, and other benefits. And we should remember that we are all in this together. Virtually all working Americans, both blue and white collar, have seen their compensation flat line in recent decades while most all of the growth in their productivity has been siphoned off to corporate interests. Public employees should support those in the private sector, teachers should support fast food and convenient store workers, organized labor should support wildcat movements, rural employees should support those in urban areas, and vice versa in all cases. When we allow one class of worker among us to be paid poverty or insufficient wages, we are hurting not just those people, but also our country, morality, economy, and signaling to our bosses that they can pay us substandard wages also. Finally, and probably most importantly, place great stock in your vote. Cast it only for those politicians who support directly increasing wages for employees, not those that ascribe to this trickle-down nonsense. Grown-ups know that things have to be paid for! Therefore, support candidates who are willing to consider reasonable taxes, especially on the wealthy or corporations, to fund employee raises and pensions, and important societal endeavors such as education and infrastructure that are essential for our economy to prosper. A factor that I believe has hurt working Americans considerably has been casting votes for candidates on the basis of social issues or guns, only to have that politician once elected do all they can to pass policies that do serious harm to the ability of most of their constituents to earn a decent living. It does not have to be this way. Remember, that the ability to earn a wage that allows you to feed and support your family, afford to go to college, care for an elderly parent, retire with dignity, and get medical care when you or your child is sick are moral issues too! Few Democrats, especially in rural areas of the country, are truly against the right to keep and bear arms. They probably support commonsense measures to keep guns out of the hands of criminals or improve gun safety, but few if any want to take away your legitimate right to have guns for responsible self-defense, hunting, or target shooting. Investigate the position on abortion and other social issues that a candidate you may have never considered voting for before may have. You may find their viewpoint is not as unreasonable as you thought. But if that is not the case, and these issues prevent you from voting for a Democratic candidate, please don’t vote for a Republican whose viewpoints will only do harm to you and your family’s economic fortunes. Find another third-party candidate or write someone in (when my wife is in these dilemmas she sometimes writes in “Jesus”). Don’t buy this “bilateral choice” argument. Vote your principles. It may take an election cycle or two but in time the desires of the electorate will be responded to and candidates will come forward with conservative social values, but who also support policies that directly benefit, and strengthen our middle class. You will actually feel good about voting for them. The development and presence of a strong middle class with its promises of fair pay, decent access to medical care, and a quality retirement, is what made our country unique, just, and strong; made us proud, and gave our children hope for the future. The middle class in our nation has been steadily degraded over the last 40 years and continues to be degraded. It is worth fighting for. Let’s mobilize ourselves and our neighbors in every effective, nonviolent way imaginable, and restore the hope and fortunes of our country, our children, and ourselves once again. The middle class is worth fighting for. Let's mobilize ourselves and our neighbors in every effective, nonviolent way imaginable, and restore the hope and fortunes of our country, our children, and ourselves once again.